Gerard de Jode was a printer, publisher, cartographer and engraver in Antwerp, active the same time period as his business rival A. Ortelius. His main work Speculum Orbis Terrarum a major World Atlas, which is extremely rare today, could not be published until 1578, eight years later than the Ortelius Atlas Theatrum Orbis Terrarum in 1570. 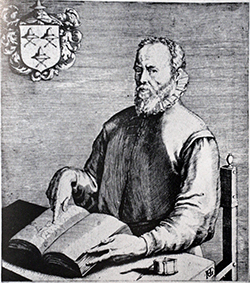 His son Cornelius de Jode reissued the Altas in 1593. The copper plates have been sold to J.B. Vrients after the death of Cornelius, but no further publication was done. Compared to Ortelius or Mercator maps, only a small number of copies have been printed and makes the maps of G. de Jode vary rare items today. Antique map of Bavaria, Wurttemberg. Printed in Antwerp by G. de Jode in 1578.